The first Wes Anderson movie I saw was The Royal Tenenbaums. I was in high school and the movie was playing on a cable channel like TNT or USA or something. I didn’t know much about the movie other than Ben Stiller and Owen Wilson were in it and I liked both of them since I had just recently seen Zoolander. I thought it was a comedy, which it was, in a sense. But as I finished the Tenenbaums, I wasn’t exactly sure what I thought. I mean, it was good—the characters were interesting, the storytelling unique, the humor was dry (which even in high school I could appreciate since I was a big Monty Python fan) but I wasn’t really sure what it was about. Though I couldn’t come up with the words at the time, it had a certain melancholy and quirkiness I wasn’t used to seeing in the typical Hollywood movies you watch in high school. I followed The Royal Tenenbaums with Bottle Rocket, Rushmore, and The Darjeeling Limited. Soon I was hooked, making sure to see each new Wes Anderson movie as soon as it came out in theaters. However, there came a time when Wes Anderson seemed to out Wes Anderson himself. The sets, while gloriously decorated and intricately orchestrated, began to feel like either a distraction or the entire point. The characters, quirkiness, and whimsy seemed to the dwarf the overall meaning and plot of each film. I couldn’t pinpoint an exact film when this seemed to occur nor was it necessarily a bad thing. It just began to feel typical, unique for Hollywood perhaps, but not unique for Wes Anderson. Therefore, with the impending release of The Grand Budpest Hotel I found myself thinking that of course I would see The Grand Budapest, but I didn’t have high hopes. I didn’t think it’d be bad, rather I just thought I knew exactly what to expect. It’d be quirky, funny, and dry, with wonderful costumes and beautifully symmetrical shots and I would leave feeling happy, but not very moved. And even though The Grand Budapest Hotel was typical Wes Anderson with the characters and sets, it didn’t disappoint and it was much more than I was anticipating. It’s a tiny bit darker than most of his films and set against the back drop of war, which gives it a more serious undertone. 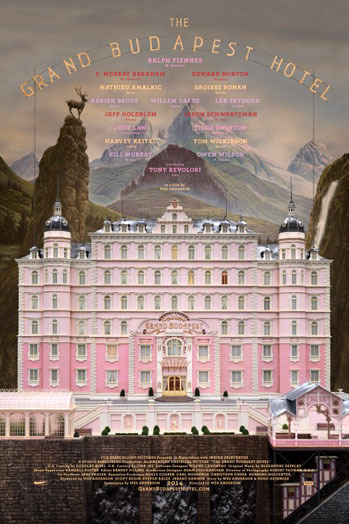 TGBH never feels gimmicky, rather it’s Wes Anderson and his characters at their finest. It’s laugh out loud funny and full of, dare I say, gripping action. TGBH unfolds in layers. First with an old writer (Tom Wilkinson) who begins talking to us about writing The Grand Budapest Hotel, the book, then to the old writer as a young man (Jude Law), talking to the mysterious owner of the Budapest many years ago, a certain Mr. Moustafa (F. Murray Abraham), who then recounts to him how he came into possession of the once famous European hotel. Enter Ralph Fiennes as M. Gustave in one of his finest roles, a hotel concierge who adopts the young Moustafa as his mentee. Gustave mixes pleasure with work constantly and will often sleep with guests (generally older women, sometimes much, much older women). He is shallow, but quick witted and full of heart and gentleman spirit. Problems arise with a contested will and a famous painting as well as the constant threat of war that seems to be ever looming in the fictional country of Zubrowka. There are some wonderful scenes: M. Gustave and Moustafa at work through the lobby, a particularly red elevator, an art heist, and a prison escape. Form matches substance beautifully and the result is wonderful in The Grand Budapest Hotel, and who could argue with a movie filled with so many great actors including regulars like Bill Murray, Owen Wilson, Willem Defoe, Adrian Brody and so on, each playing such a unique character that not one feels forced or over the top. At the end of the day it’s still a Wes Anderson film, but it seems more somehow, with deeper meaning and richer relationships. Undoubtedly it’s one of his finest, perhaps even his best, although it’s probably too tell.